The Chihuahua is a small dog breed that is very popular due to their small size. In addition to being adorable pets, they are intelligent, restless and curious companions who will offer all their love and loyalty to those that take care of them. There is some debate about the origins of the Chihuahua. Some say they are of European lineage however archaeological findings and local folktale in Mexico indicate that they actually existed in Mexico at an even earlier date. Historians believe that the breed is a descendant of dogs that were around in the ancient times, when a Mexican civilization known as the Toltec kept very similar tiny dogs called the "Techichi". This theory of the origins of the chihuahua, is supported by dog burials that were found in Mexico that dated back as far as 300BC. The Chihuahua is a small dog, compact and fast moving. The adult Chihuahua usually weighs between 4 to 6 pounds and are 6 to 10 inches in height. These measurements can vary between the two types of Chihuahua dog; the apple headed Chihuahua and the deer headed Chihuahua. The apple headed Chihuahua is the most common. Their head has, as its name indicates, a shape similar to that of an apple that gives them a sweet and careful appearance. They have two large and separated ears that are almost always in upright position. In contrast to a large head and bulging eyes, their body is small and thin. The dear head Chihuahua is usually somewhat bigger then the apple head Chihuahua. The shape of their head is longer and, in some cases, resembles that of a small deer. They are also slightly taller and slimmer. 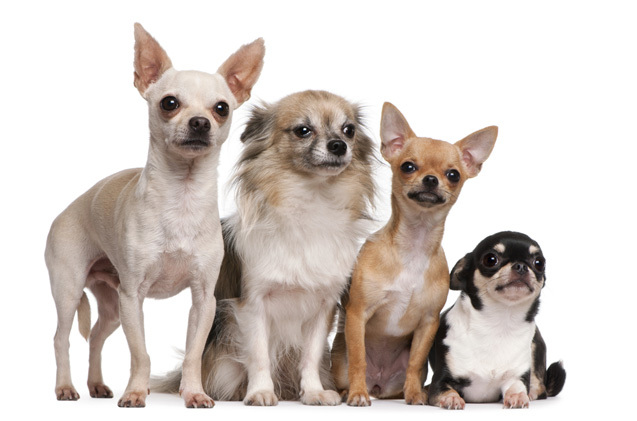 Chihuahuas can have two different types of coat; smooth coat (short-haired) or long coat (long-haired). You will find countless colors such as white, coffee, black, chocolate and cream. Moreover, they can also be bi-colored, tri-colored, mottled or with lines. Chihuahuas should definitely not be thought of as just lap dogs. They are alert, quick and feisty little characters. They will definitely stand up for themselves or their owners when they feel they have to. A Chihuahua is really a big dog in a small dog's body and will take on the world without hesitation. Chihuahuas may be anxious, protective, snappy or withdrawn if not well socialized so we highly recommend that you socialize your furry friend. Chihuahuas are very small so they can be prey for larger animals so be aware of your surroundings when walking them off leash or when at large outdoor dog parks. The Chihuahua is rather spirited and highly intelligent and for these reasons they are popular as companion dogs. If your Chihuahua has a tendency to get overly anxious, CBD treats can be very effective in helping them manage stress and anxiety. Chihuahuas are clever but also strong-willed like going by their own agenda. Training needs to start early and it is also essential for them to be socialized early so they grow up to be well grounded dogs. It is important that the owner is consistent in its training and does not spoil the dog just because it looks small, cute and helpless. As already mentioned, Chihuahuas are very brave and intelligent dogs so it is easy for the dog to think it is dominant over its owner if his owner is too soft with him. This can cause behavioral problems such as snapping and aggression with other dogs or people at a later stage. The average life expectancy is between 10-18 years. These tiny dogs are remarkably healthy and sturdy considering their size. However, health issues that seem to affect them most are patella luxation, epilepsy, low blood sugar and collapsed trachea. Because they have large protruding eyes they are also prone to eye infections and eye injuries. This breed will also require special veterinary care when birthing a new litter of puppies due to its small size. Chihuahuas are dogs that adapt perfectly to urban life and you will have no problem living in a small apartment with them. Even so, they can be a very restless and nervous dogs. It is recommended that you take them out for a walk at least twice a day to exercise and play with them. Chihuahuas are sensitive to the cold and heat because of their small size, especially those with short hair. You can easily find clothes in their size to help them keep warm in chilly weather. Both the long-haired and short-haired Chihuahua are easy to keep clean and well groomed. However, the long-haired version might need slightly more brushing to avoid painful matting at the edges. It is also important to clean their teeth and ears regularly to avoid any complications. Chihuahuas are a great choice for a person that wants the affection and companionship that only a dog can provide. And living in a small apartment will not matter! However, this may not be the best breed for people with young families. Small children and toddlers may be a little bit too rough for the small Chihuahua and could easily scare it or even injure it. Great care is required, especially when you get a young Chihuahua puppy. Treat it gently to avoid injury, but make sure to provide assertive leadership to your dog. Also ensure that your new pup receives plenty of socialization early to avoid behavioral issues later on.